When Tommy Batchelor is the boy in question, there is no doubt about it – the kid can dance. Batchelor, age 14, is one of four youngsters who grace the Chicago stage as the title role in “Billy Elliot The Musical”; though his ballet skills were significantly refined, his tap dancing and his stage presence truly impressed at this June 15 evening performance. Set in County Durham during the 1984-85 coal miners’ strike, “Billy Elliot The Musical” paints a portrait of an underprivileged young man whose talent as a dancer carries him toward a brighter future. 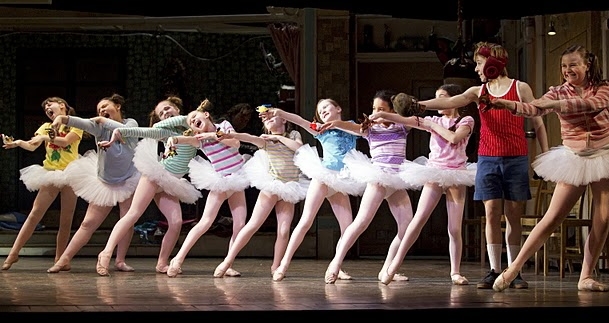 Though he originally begins as a boxer, Elliot comes to ballet by happenstance; he stumbles through the steps amid a sea of tutu-clad ballet brats while waiting to hand off keys after a boxing lesson. After months of private lessons with his ballet mistress Mrs. Wilkenson (played by Emily Skinner), Elliot auditions for and is accepted into the Royal Ballet School. Like his character Billy, Batchelor’s ballet technique shows great potential. Solos featuring single leg turns and pirouette series highlighted the young danseur’s sense of center, but his lines occasionally lacked the finish of a long, pointed foot. That being said, the boy is certainly no slouch on the dance floor; an energetic, highly physical duet with professional danseur Samuel Pergande proved that Batchelor is well on his way to mastering balletic movement vocabulary, and that his stage presence is already off-the-charts. Batchelor’s frenetic energy and endearing showmanship were highlighted several times throughout the evening. The songs “Expressing Yourself,” “Born to Boogie,” “Angry Dance,” and “Electricity” showcased his advanced tap and acrobatic skills while simultaneously emphasizing his likability as a character in the show. As Elliot, Batchelor had no trouble winning over the crowd; he did so almost immediately in the first act. From Elliot’s early humorous banter with his grandmother (played by Cynthia Darlow) to his later nonjudgmental stance toward homosexuality, he proved that he was wise beyond his years and that he deserved a better future than that which his small mining town could offer. Whether Batchelor’s character knew it or not, his community had been behind him every step of the way, metaphorically speaking; in many scenes a corps of male miners was featured dancing behind or alongside Elliot, mirroring his tumultuous experience with their own plight as workers on strike. Such choreographic choices created a framework for Elliot’s journey that was both aesthetically and intellectually satisfying on a deep level. And though his passion for dance was initially rejected by his family (including his father, played by Armand Schultz) and their mining peers, Elliot ultimately found support from his community in the way he needed it the most – financially. In a show of true brotherhood and forward-thinking, the miners’ association banded together to raise the money to send Elliot and his father to his Royal Ballet School audition. Like a good boxer, “Billy Elliot The Musical” knows how to hit an audience and make the effects linger – after this show tugs on your heartstrings, there is no forgetting its dynamic tension or its graceful but bittersweet resolve.